When job seekers send their resumes to large employers in hopes of landing a job, they should keep in mind that in many cases there are software platforms in place to screen those documents before a human being even sees them. When businesses are inundated by resumes for every job opening, it only makes sense for them to automate the process of screening candidates to some extent, but that also means applicants need to be smart about learning to "beat" these programs. Perhaps the most basic rule of thumb here is to mirror the language in the job listing as closely as possible, editing your existing resume to contain the kinds of keywords that will tick all the boxes of what the AI-based software is looking for, according to AZ Big Media. But beyond that, it's also important to make sure you're meeting the basic qualification standards a job listing lays out; the platforms can identify when applicants don't match what companies are looking for, so it's important to make sure your resume lines up with what's in the listing. Furthermore, many of these platforms also try to ensure resumes aren't too long for hiring managers to sift through quickly, so it's important to keep it succinct, the report said. While that does not preclude candidates from sending two-page resumes, it's wise to not get particularly wordy with any one line or example of work experience, and to always make sure to list dates last on any information sent. In addition to those basics, it's also important for people to be as specific as possible about their work history, according to career coach Rachel Montanez, writing for Forbes. That includes listing their exact job titles for whatever relevant positions they have held in the past, as well as their time of employment down to the exact months they stopped and started, at least as much as they can remember. Furthermore, anyone who gets a little too "fancy" with their formatting will likely see their resumes screened out, the report said. As a result, they should focus on using basic fonts - Helvetica, Georgia, Calibri, etc. - and a simple format that makes their resumes easy to read. While some candidates might like to include graphics on these documents, that isn't always a good idea either. 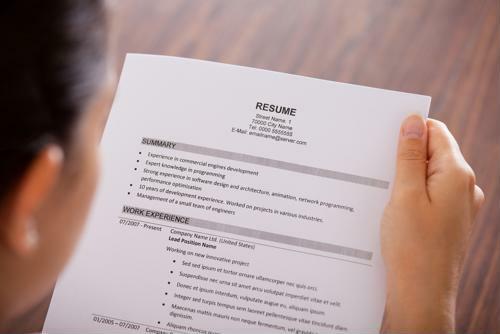 At the same time, simply using a basic resume format that can be found online is another common way to get screened out, too, according to The Balance Careers. Taking a few steps to make the document unique without going too far afield is always a good idea. In addition, they should try to make sure the formatting includes keeping margins of at least 1 inch on every side, and fonts no smaller than 11 points. Some people may try to fudge these aspects of the document to fit more information onto one page, and screening software knows to stop that in its tracks. It's worth noting that these are just basic tips, and those who have had particular difficulty getting through these systems may want to search online for more information that might pertain more specifically to their individual resumes.